In just a few clicks, healthdirect’s symptom checker provides professional health advice about the most appropriate response to medical concerns for you and your family. 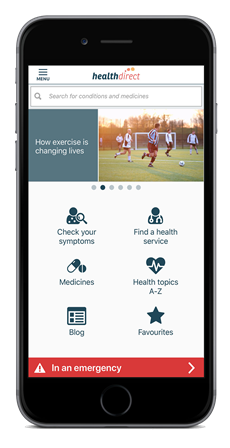 The symptom checker has been developed in consultation with general practitioners and medical specialists to provide safe, relevant and accurate information to Australians. If you think you have a medical emergency, call triple zero (000). Information provided by Healthdirect Australia’s symptom checker may help you manage non-acute medical conditions however this information is not an alternative to, or substitute for professional medical advice. The mobile app is available on iOS and Android OS. Watch a video on how the app works on phones (external site). Call healthdirect on 1800 022 222 for free 24 hour health advice.